He is huge! And classy, very well bred, and sound. When we walked up to his shoulder and withers to do a height estimate, we couldn’t believe how much he towered over our 16.1 (that’s 5’5″ in human terms) volunteer. This stunning looking gentle giant is described as a playful but good boy, who will do anything to mooch a mint. 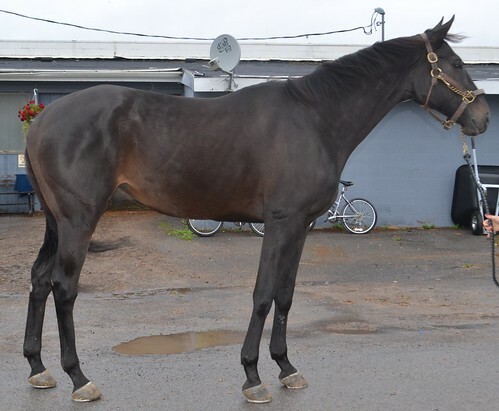 Pisces has been a good consistent race horse, with 5 wins and almost $185,000 in earnings. He was allowance class at Belmont and Saratoga when he was younger. 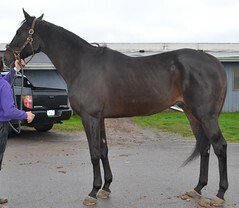 His owner states that he is sound, and she will keep racing him a few more times until the end of the meet if he does not sell to a perfect new home. He showed very good movement for his jog video, with a predictably big stride. This leggy big guy should eat up the cross country course, but we think he could excel in just about any discipline. He is by Empire Maker (grandsire of American Pharoah), out of a stakes winning mare who has two multiple stakes winning sons who have earned over $500,000 — including Piscesbymoonlight’s 3/4 brother who won a stakes at Saratoga this summer.